The world is full of must-visit cities, each with its own unique character and identity. From the culturally-rich Mexico City to the architecturally appealing Vienna, and from the historic city of Rome to the colourful Addis Ababa, no two cities are the same. Over the years, I've been lucky enough to visit a large number of cities across the world. In this article I look beyond the big four of London, New York, Paris and Sydney, and highlight some of my favourite cities. Be prepared for some surprises. Vienna is definitely one of the most underrated European cities. Though expensive, the Austrian capital is both clean and safe, and has a surprise waiting around almost every corner. The city centre has a beautiful building after another and those with an interest in architecture, photography or European history will never be bored. St Stephen's Cathedral, Hofburg Palace, the Spanish Riding School and Museumsquartier are among the attractions in the city centre. Not far away is the magnificent Belvedere Palace, while the trip to Schönbrunn Palace, on the edge of the city, is well worth the effort. Schönbrunn is also the site of Vienna Zoo, which has a fine collection of animals. A walk through the city centre after dark is also very pleasant, with many of the historic buildings floodlit. Don't forget to pack your camera. Barcelona, the capital of Catalonia, is many people's favourite European city break destination, and it's easy to see why. The city has beaches, cultural attractions, great food, and some of the world's most famous architectural delights. It is a large city with a number of distinct areas and will take some time to fully explore. Unlike most major European cities, Barcelona is built on the sea. As well as the bustling port - one of the busiest on the Mediterranean - and a larger marina, there are beaches in Barcelona itself, making it the ideal place to combine a city break and a sun holiday. Many of the main sites are located in and around Montjuic, along the seafront, and in the Old Town, though visitors will have to venture further afield to witness Gaudi's most famous creations, and arguably the most famous of all Barcelona's attractions - the unfinished Sagrada Familia, and the colourful Parc Güell. Be sure to spend time exploring La Rambla, a tree-lined street containing shops, cafes and mansions, and brought to life by the mime artists, musicians, tarot readers and street vendors who hang out there. Placa del Marques de la Foronda is particularly spectacular during the colourful fountain displays at night. Other attractions include tours of the Nou Camp, Barcelona FC's famous grounds, and Gaudi's other creations including Palau Güell and Casa Milà. Budapest is one of Eastern Europe's most popular destinations. The Hungarian capital is full of architectural delights, and despite it's growing popularity, Budapest remains a very affordable destination. The castle complex, dominates the city and is just as important for the buildings, walls and streets that surround the Royal Palace as it is for the palace itself. It forms the heart of Buda, the section of the city to the west of the Danube, and will take a day, at least, to explore. Dominant features within the Pest ‘half’ of town include the beautiful Parliament building (the design of which is based on the Houses of Parliament in London), St Stephen’s Basilica, and the grounds of Vajdahanyad Castle. This may be a surprising addition, but Mexico City is a must visit destination. 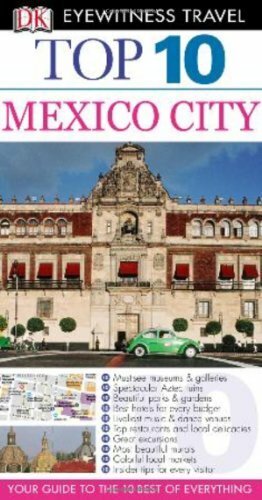 There is lots to see and do in Mexico City. It has more museums than any other city in the world, and many attractions relating to its time as an important Aztec and Spanish Empire centre. Centro Historico, the historic centre, is focused around Plaze de al Constitucion (Zocalo), a large square surrounded by the largest cathedral in the Americas (Catedral Metropolitana), the National Palace, and Templo Mayor, and important Aztec pyramid complex. Bosque de Chapultepec, the large public park on the edge of the city centre, contains a number of attractions, including a large zoo with free entry, the National Anthropological Museum, the National History Museum, the Museum of Modern Art and La Feria Chapultepec Magico, the largest amusement park in Mexico. The Xochimilco Floating Gardens, a UNESCO World Heritage Site in the southern suburbs, is also worth a visit. This handy, handbag-sized travel guide contains a fold out map, which includes all the pain sites, information on the top ten attractions, and lots of other information sites, things to do, places to eat and stay, and general travel advice. San Francisco is my favourite US City, and has lots to see and do. Renowned for its very hilly location, cable cars climbing very steep streets are more often than not the subject of photos and paintings of the city. Other iconic views include the magnificent Golden Gate Bridge, and the row of colourful Victorian houses on Alamo Square set against a backdrop of skyscrapers. Alcatraz Island, which sits in the bay, is the site of a notorious former prison. Golden Gate Park is also worth a visit, as is Pier 39, a somewhat tourist centre in the harbour, which is home to a large family of Californian sea lions. Africa should be on everyone's hit list. The cities of sub-Saharan Africa are, however, dangerous and not all that appealing. Addis Ababa is a exception. Yes, you need to have your wits about out, and poverty is prevalent and evident, but you can get around pretty safely. It is probably the best place to explore the colour and noise of African urban life, and once you wander beyond the city limits, you can explore African culture, landscape, and urban life at its very best. There is lots to see and do in Addis Ababa, including Mercato, widely accepted to be the largest market in Africa; the much smaller Shiromeda Market, an ideal place to shop for souvenirs; the Entoto Saint Mary, Emperor Menelik and Empress Taitu Memorial Museum, located next to the Entoto Maryam Church on Mount Entoto in the hills overlooking the city; museums such as the Red Terro Marytrs Memorial, The National Museum of Ethiopia, which houses the skeletal remains of Lucy (Dinknesh), one of the oldest humanoids ever discovered and the Ethnological Museum, located in the former palace of the infamous Emperor Haile Selassie. The Eternal City is the heart of European history; its iconic landmarks recognisable the world over. From the Colosseum and the Spanish Steps to the Trevi Fountain, and St Peter's Basilica in the Vatican, Rome is packed with sites to see. Rome is best explored on foot, and you can take a stroll through the centuries from the Roman Forum, Collesseum and Palatine Hill ruins of Ancient Rome, towards the 2nd century Pantheon, through streets packed with 15th and 16th century buildings, fountains and piazzas. Further explore the history of Rome, Italy and the Catholic Church in the magnificent St Peter's Basilica and the adjoining Vatican Museums, where the famous Sistine Chapel is not to be missed. Spend a relaxing day at the Villa Borghese, before heading to the catacombs and other attractions just beyond the city limits. Morocco’s former capital and third city may not be as well known as Marrakech, Rabat, or Casablanca, but it is every bit as appealing, and slightly less crowded. The city has two old medinas, packed with historical and cultural sites and experiences. Fes el Bali, the larger of these, is a UNESCO World Heritage Centre and the main area of tourist interest in the city. It is also, apparently, the world’s largest car-free urban areas. Many of the medina’s narrow streets are just about wide enough for a donkey, laden with goods, to pass. Simply lose yourself among the streets and craft stalls within the medina, absorbing the sights, sounds and smells of Moroccan urban life, and feast on Moroccan culinary delights in one of the rooftop eateries overlooking the hustle and bustle below. Italy is full of historical cities, and while Florence and Venice are more famous, Siena is a little treasure. It still gets a lot of tourists, but it is easy to get around and has some hidden treasures. The grandeur of Siena is practically unchanged since the city – once a Tuscan capital to rival Florence – was at its peak in the late 13th and early 14th centuries. Siena’s highly decorated Duomo is one of Italy’s most magnificent cathedrals, a statement worth noting in a country full of spectacular churches and cathedrals. The city centre consists of the famous fan-shaped Piazza del Camopo, dominated by the slender Torre del Mangia which offers spectacular views of the surrounding city and countryside, and surrounded by narrow medieval streets. Scandinavia is beautiful, and its cities are full of European splendour. Stockholm, built on a series of 14 islands in a narrow strait between Lake Mälaren and the Baltic sea, is particularly beautiful. The waterside location provides a stunning backdrop to the city's beautiful buildings, which include the Stadshuset (Stockholm's City Hall), and Kungliga Slottet (The Royal Palace). Djurgården, and island in central Stockholm, is home to an open air museum (Skansen), museums, galleries, historic buildings and monuments and an amusement park. It also contains forest and green areas and is one of the most popular recreational and tourist areas of the city. A walk through the narrow cobbled streets of Gamlastan is also particularly rewarding. Be sure to take a boat trip to the magnificent Drottningholm palace, a magnificent waterside building just beyond the city limits. Bruges is often known as the Venice of the North. Its historic centre is built on a series of picturesque canals. Fine medieval buildings, churches and civic buildings line narrow winding lanes and the canal banks in a city centre which is highly pedestrianised and litter-free. The Markt, a 13th century market square in the heart of the city, is lined by distinctive gabled houses, and the Belfort, and octagonal bell tower which featured in the film In Bruges. There are many churches of note, including the Church of Our Lady and the Basilica of the Holy Blood, the city's holiest church which contains a phial said to contain a few drops of blood and water washed from the body of Christ. Shop for chocolate and lace in the town's many small stores and take a pleasant walks out of the city along the canal banks. Prague is one of the most beautiful cities in Europe. It was larger than London and Paris in the late Middle Ages when its position as that crossroads of Europe saw it grow into a magnificent and important capital city. The historic centre, the Old Town, is well preserved, despite neglect under Communist Rule. The 11th century marketplace, now the Old Town Square, forms the heart of this quarter, and is home to the famous astronomical Clock and calendar on the Old Town Hall Tower. Narrow streets, full of character, lead away from the square. Sites of interest in the adjacent Jewish Quarter, once a ghetto to which the city’s Jewish population were confined for many years, include the 13th century Old-New Synagogue and the Old Jewish Cemetery. The beautiful Charles Bridge leads from the Old Town across the river to the Little Quarter and Prague Castle and HradÄany, both of which contain a number of sites and attractions. The castle and grounds forms the dramatic backdrop to the city and will take a day to explore. The complex retains features from each period of its existence, including buildings in Gothic, Renaissance, Late Baroque and Neoclassical styles. Brussels city centre has many pretty buildings, most notably surrounding the splendid Grand Place in the lower town. Wander the narrow cobbled streets, shop for chocolate and treat yourself to Belgium's famous waffles. Then head to the upper town and take in the splendour of the elegant parks and palaces, as well as the shiny post-modern buildings which house European Union parliament and offices. To the north-west of the city, Bruparck has attractions for all the family, including Mini-Europe, Oceade (a heated waterpark), the 29 cinema Kinepolis, and Atomium, the city's most recognisable landmark. There are art galleries, museums, churches, monuments and parks galore. Don't miss the magnificent Basilica of the Sacred Heart in Koekelberg, one of the largest churches in the world. For a small fee, you can climb to the top of the basilica's dome, and get a spectacular perspective of the city below. One of Europe's most vibrant urban centres, Germany’s capital and cultural heart, is a must-visit stop on any European city tour. In addition to its turbulent Cold War history, Berlin is noteworthy for its lively nightlife, its thriving music and art scene, and its modern architecture. Graffitied remains of the Berlin Wall, the Holocaust Memorial, the Brandenburg Gate and the Reichstag are not to be missed, and the short train journey to Potsdam and Park Sanssouci is well worth the effort. And last, but by no means least, the beautiful city of Edinburgh. The Scottish capital is divided into the Old Town, with its narrow, winding and hilly streets, and the well laid out 18th Century Georgian New Town. The Royal Mile, which runs the length of the city centre from the imposing Edinburgh Castle forms the main axis of the old town, while the shops and sites of the new town are centred on Princes Street. There's lots to see and do at any time of the year, particularly in August during the Edinburgh Festival and the accompanying Fringe Festival (which has, in fact, grown to be much bigger than the Festival itself). If you choose to visit at this time of year, expect accommodation to be at a premium. It is estimated that Edinburgh’s normal population of 400,000 doubles during the festival. Learn about these and other European cities in this informative and fully illustrated DK Eyewitness guide. 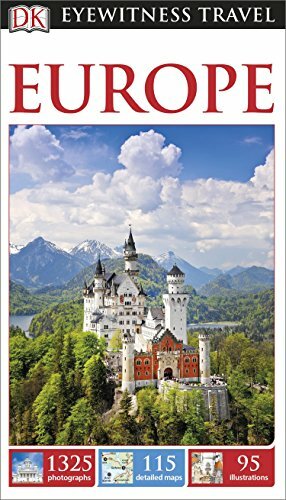 It includes information on all the top sites, suggested walking tours, and overviews of the major cities and tourist attractions of Europe. DK also publish Eyewitness guides for individual cities and countries across the world. These are just 15 of the most interesting cities to visit, each with its own unique set of attractions, sites and activities. The world is full of splendid cities; get out there and enjoy them. Very nice article on some of the most beautiful cities in the world. I've visited Vienna, Budapest and Prague on your list, and I absolutely agree, they are some of the most beautiful places. Now I just have to add the other cities to my list. Thank you for this article. I would be hard pressed to keep my list of favorite cities to only 15, but Edinburgh and Vienna are definitely two of my personal favorites. Keeping it to just 15 is indeed difficult! Vienna is definitely one I want to revisit! I've recently visited Madrid for the first time. It makes a strong argument to also be included here. Especially good city for those who like to run with Casa de Campo providing a great playground for those who like to exercise outdoors!